If you drop just one soda can out the window, it’s no big deal ... right? But what if everybody did that? What if everybody broke the rules...and spoke during story time, didn’t wash up, or splashed too much at the pool? Then the world would be a mess. But what if everybody obeyed the rules so that the world would become a better place? Using humorous illustrations rendered in mixed media, these questions are answered in a child-friendly way and show the consequences of thoughtless behavior. 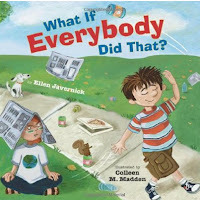 This book is a great way to teach children the reason why we have so many rules (especially at school and in public places). It's not always because the behavior is dangerous or rude, it's because, "What if everybody did that?" Great way to teach a simple concept that is sometimes very difficult for impulsive children to master.